1. 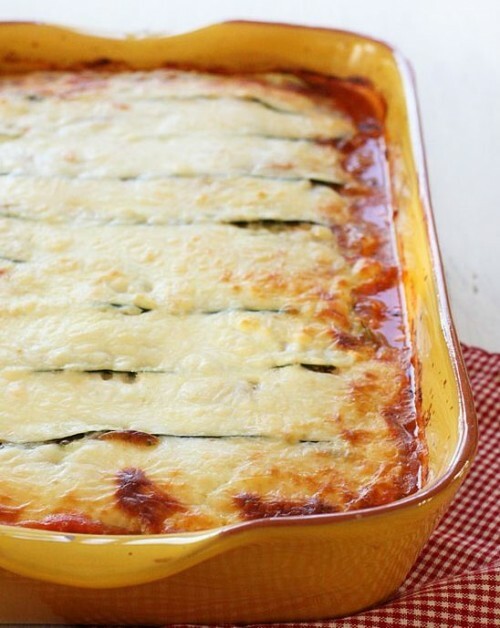 First up is this Zucchini Lasagna from Skinnytaste. If you’re a Pinterest user you’ve seen this photo at least one gajillion times in your feed. Why? It’s gorgeous, that’s why. If this photo doesn’t make you want to dive into that pan like Bugs Bunny from a high diving board into a tiny drinking glass, then you need to check your pulse. Also, gimme your share because I’m all over it. 2. 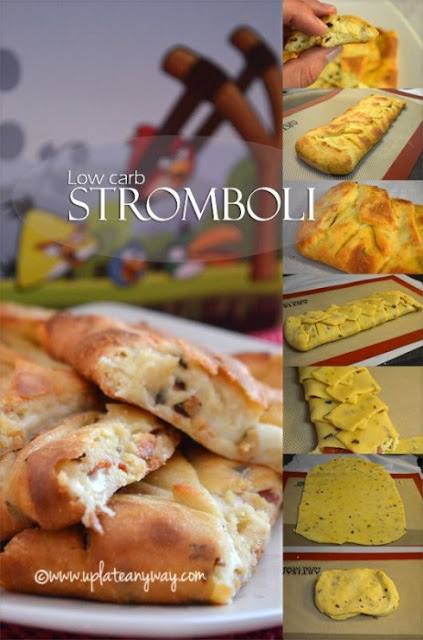 Next on our list of craveable low carb Italian recipes is this totally legit looking Stromboli from Up Late Anyway. If this is the kind of genius recipe that she comes up with during her late night brainstorming sessions, give that chick some espresso and NEVER LET HER SLEEP AGAIN. 3. There’s nothing like a good pasta salad! 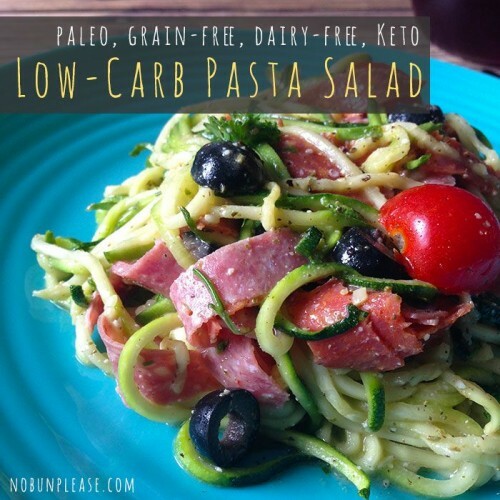 This fantastic Low Carb Pasta Salad recipe from No Bun Please has all of your favorite ingredients and none of the carbs thanks to the substitution of zucchini noodles! It’s also dairy free for you lactose intolerant peeps! 4. 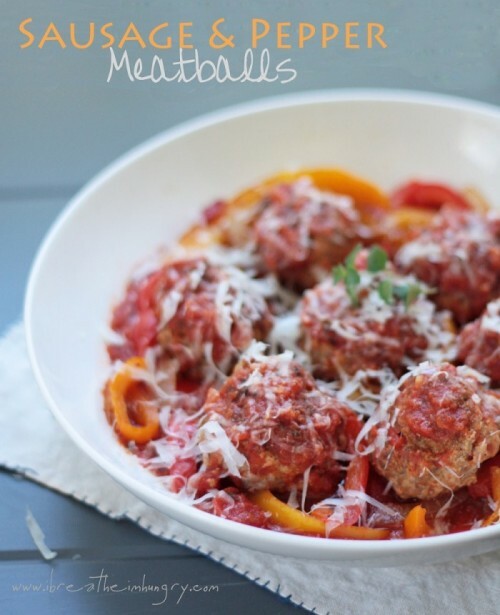 This Meatballs alla Parmigiana recipe from right here on IBIH remains one of my most popular low carb recipes of all time, and for good reason! 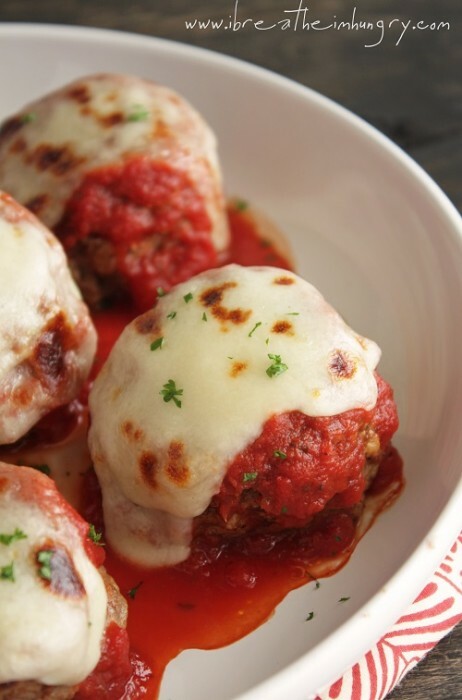 The meatballs are tender and flavorful, and who doesn’t love lots of sauce and cheese on top? 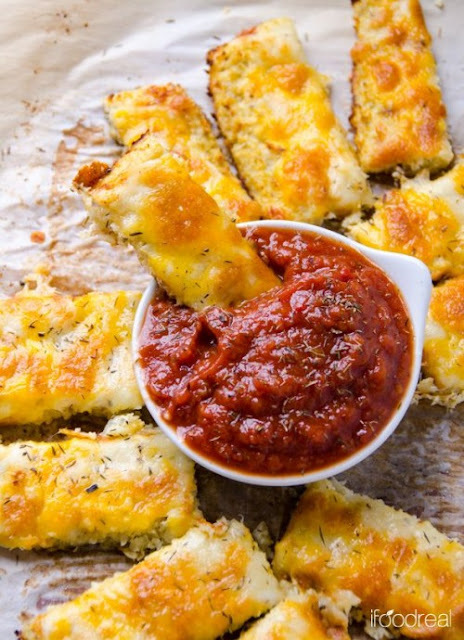 Easy to make, they also reheat well as leftovers and your kids will love them! 6. A classic low carb substitute for traditional pasta is zucchini noodles made with a spiralizer which will run you anywhere from $10 to $35 depending on the style. 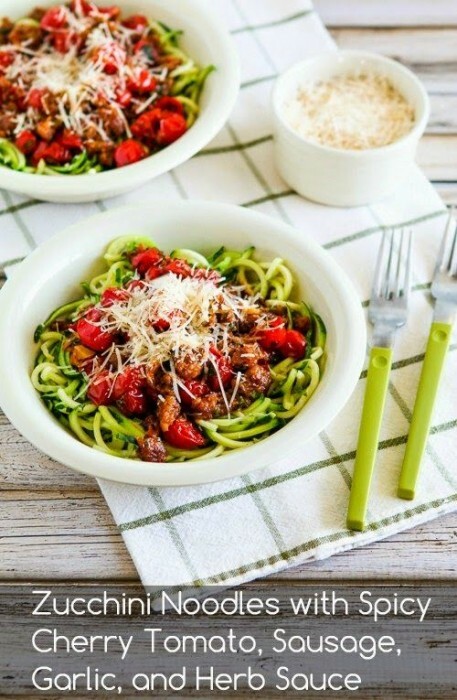 Kalyn’s Kitchen gives us this beautiful and spicy low carb recipe which is made with Italian Sausage and Cherry Tomatoes. Sweet! 7. 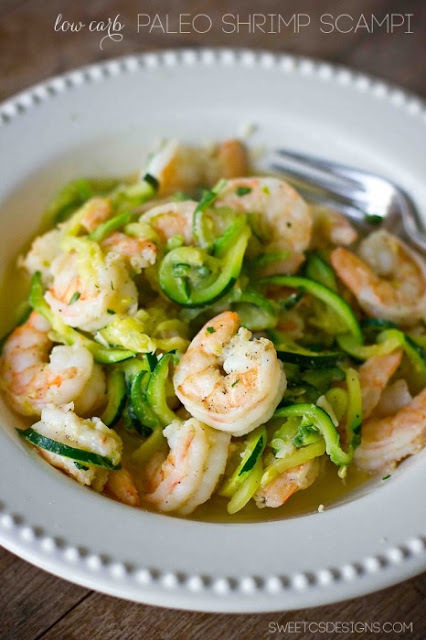 If red sauce isn’t your thang, you could always sauce your zoodles with a lemon garlic sauce in this gorgeous low carb shrimp scampi recipe from Sweet C Designs! 8. 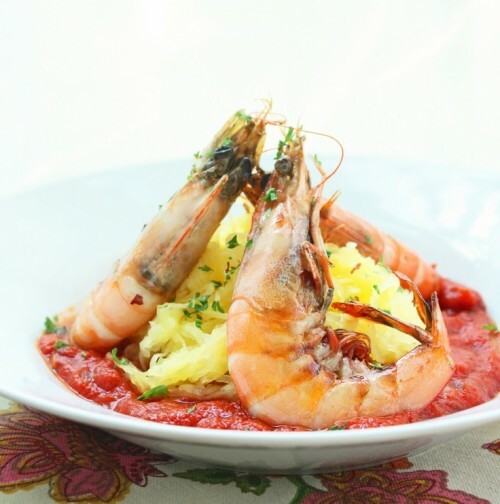 This low carb Shrimp Fra Diavolo recipe from here on IBIH never really took off with my readers (maybe it was the creepy shrimp eye staring at you from the photos) but it’s really, really delicious so give it a chance! PS, you can make it with regular peeled shrimp. 9. No Italian recipe roundup would be complete without pizza, and I’ve got a couple of beauties for you today. 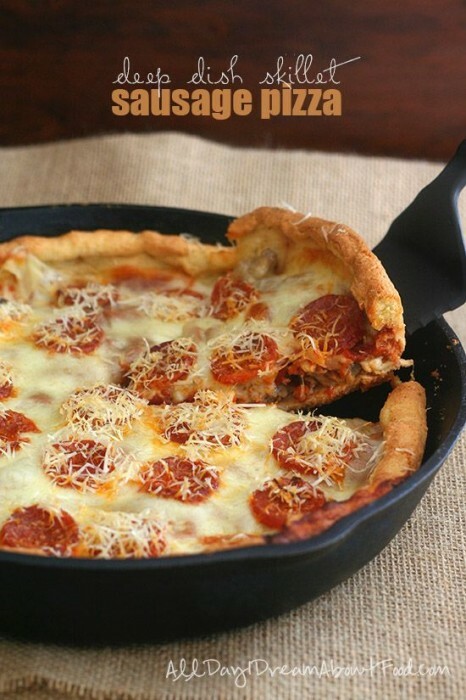 I’m more a of a New York style girl myself, but this gorgeous low carb Deep Dish Skillet Sausage Pizza recipe from All Day I Dream About Food might convert me to the Chicago style after all! 10. 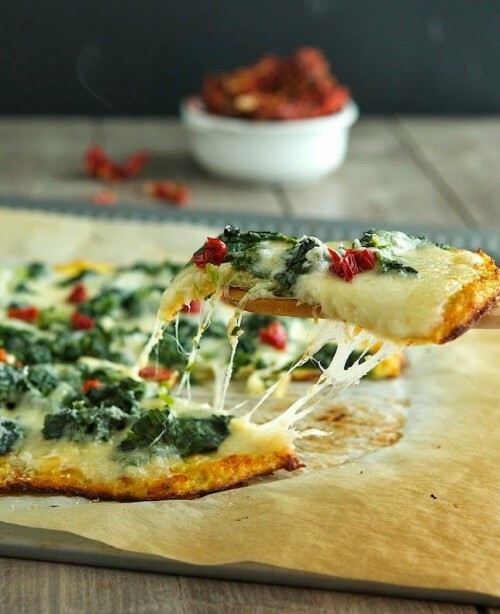 If you’re all about the thinner style pizza like me, then you’re going to love this gorgeous low carb cauliflower crust pizza from The Iron You! 11. Ever miss garlic bread? I do! Let’s all have a moment of silence for bread. Then get over it because ifoodreal has these gorgeous low carb breadsticks for us to nosh on! 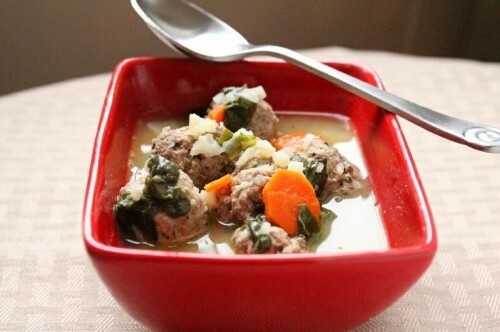 All the flavor without the gluten and carbs? Yes, please!!! As an added bonus she gives us step by step instructions, making these totally foolproof! 12. One of my favorite meals growing up was sausage and pepper sandwiches! I put all of my favorite flavors from the traditional sausage and peppers that I grew up on into this awesome low carb sausage and peppers meatball recipe! 13. 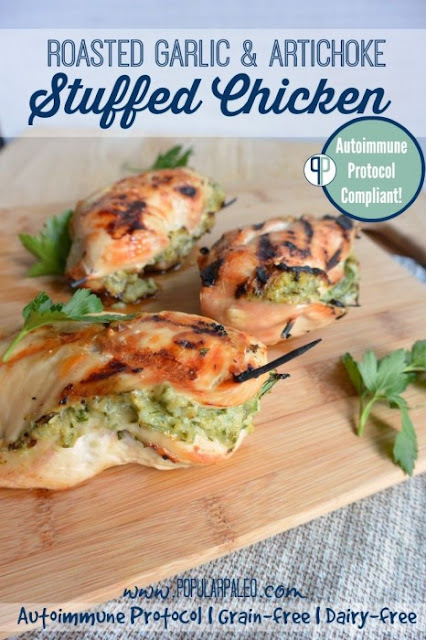 I love artichokes, so these roasted garlic and artichoke stuffed chicken breasts from Popular Paleo are right up my alley. I’d probably load mine up with cheese (just being honest), but for you lactose challenged peeps this recipe is diary free and autoimmune protocol compliant as well. 14. 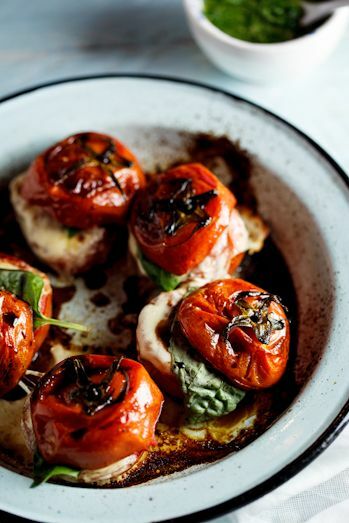 Honestly I chose this Roasted Caprese Tomatoes with Basil Dressing recipe from Simply Delicious because it’s just gorgeous. I could stare at this photo for hours, and can almost taste the sweet char on those tomatoes from here. Also I’m obsessed with enamelware right now and totally coveting that awesome dish. These tomatoes would go perfectly with the artichoke stuffed chicken recipe above – make it, then be sure to invite me over, I’ll bring the vino. 15. Not everyone likes the bitter flavor of broccoli rabe (rapini), but I just love it! 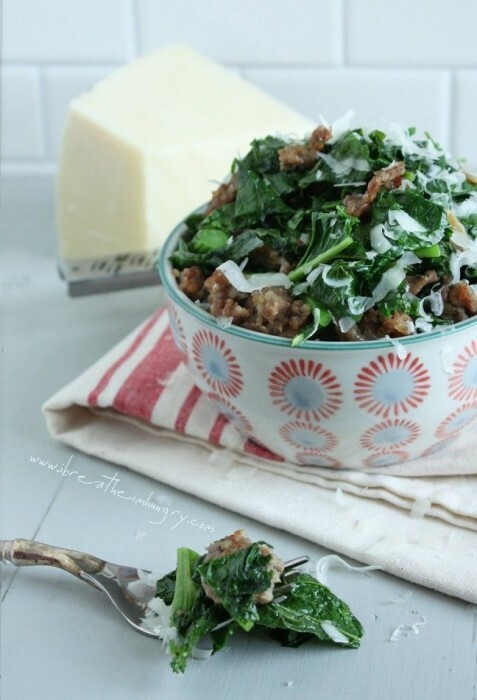 It’s toned down a bit in this recipe with the fat from the Italian sausage and Parmesan cheese, making it a bit more mellow. This is a great (and easy) low carb side dish recipe – but I’ve also eaten it reheated on its own for lunch! With lots and lots of cheese of course! 16. 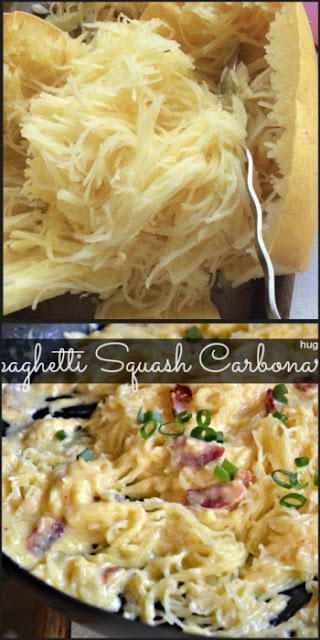 This low carb Spaghetti Squash Carbonara recipe from Hugs and Cookies XOXO is dear to my heart both for that creamy sauce, and for the bacon in it. You totally saw that coming huh? I’m so predictable. 17. 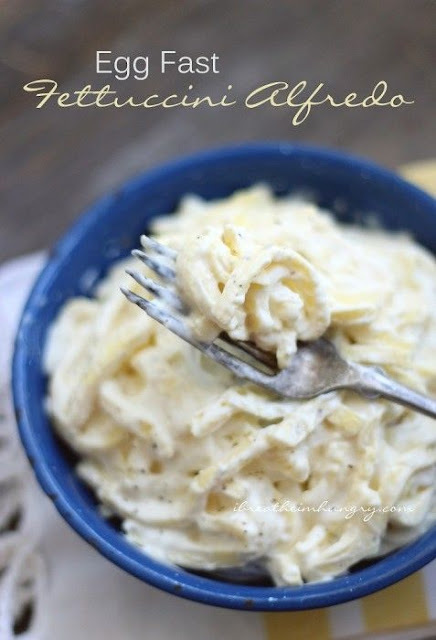 If veggie based pasta substitutes like zucchini and spaghetti squash aren’t really doing it for you, try my low carb fettuccini alfredo recipe made with a savory variation on the cream cheese pancake recipe. If you’re skeptical just have a gander at the recipe comments – they really are THAT good! Even Mr. Hungry is a fan, and when it comes to fake pasta he’s a tough sell! 18. You guys still with me? aldkjl;sghglskfjgastapwoierlkaalsdjgalsjalsjlaskjlasdjg;lajs…?? just checking! 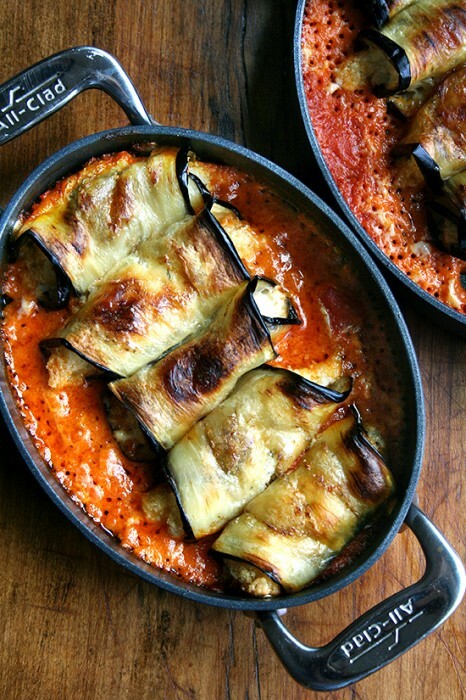 I love eggplant parmesan, and these super pretty eggplant involtini from Alexandra’s Kitchen look like a perfect low carb substitute! And JUST LOOK AT THOSE CHEESE BUBBLES! I want to go at them with a spoon like it’s my job!! NOTE: This recipe calls for breadcrumbs in the filling – substitute 1 large egg instead and it will keep the ricotta cheese from leaking out during baking. 19. 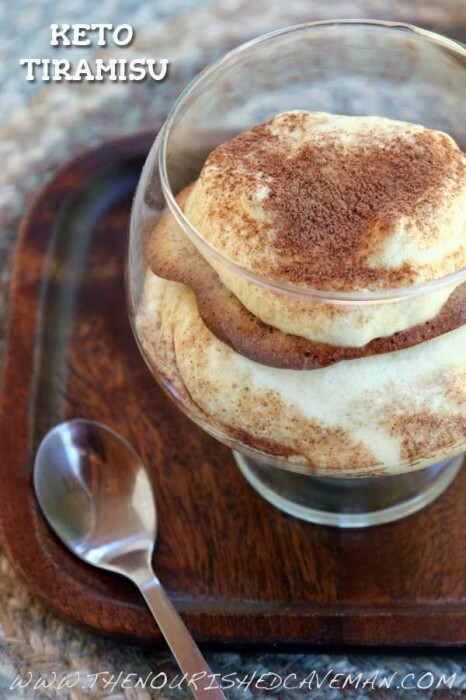 Almost done and now it’s time for some low carb italian dessert recipes! First up is this gorgeous low carb (and keto) tiramisu recipe from The Nourished Caveman! I think the picture speaks for itself here, but in case you need more convincing, it’s basically a stack of coffee flavored cookies, sweetened cream and cocoa powder. And it’s delicious!!! 20. 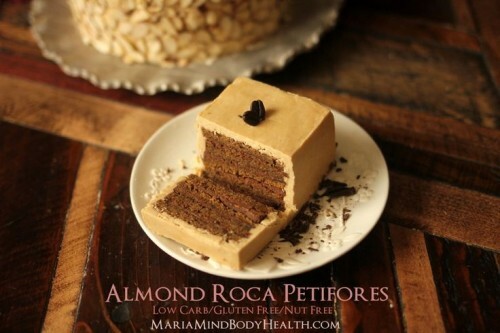 Last but not least is this adorable low carb Almond Roca Petit Fours recipe from Maria Mind Body Health! She’s also got a recipe for a bigger cake in the same flavor and it’s super gorgeous! If I could just order this cake online I’d buy one of those massive chest freezers and jam it full of them. It would be AWESOME. So what do you think? Did I cover all of the bases? 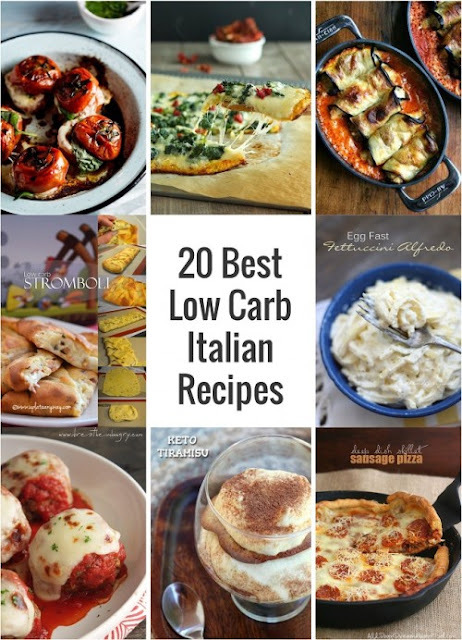 If you think I missed some great low carb Italian recipes in this roundup, feel free to link up your other favorites in the comments!